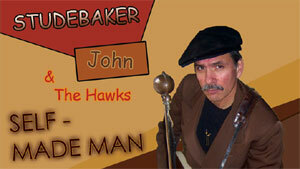 Chicago blues man Studebaker John continues his no holds barred assault on his new Evidence release. The self-taught harp/guitar master learned from the greats by observing them regularly on Maxwell Street. The picturesque cover depicts John jamming on a rooftop with the Chicago skyline in the background. Ironically, he doesn't play the blues like Chi-town's veterans. John incorporates the influences of past blues legends while widening the borders of both instruments he plays. His playing began at age seven when he picked up a harp belonging to his father. Years later, John was inspired to play slide guitar after seeing Hound Dog Taylor perform. His music is tough and raw but at times throughout the 12 track, 52-minute disc, it gets subtle and delicate. All the songs are original compositions by John and to finish putting his mark on the CD, he also produced it. "Burned By Love" is heavy and forceful and hits you hard. The rich, powerful bass of Felton Crews provides the foundation for John's frantic guitar solo. Overall the tune includes a shuffle-like feel edged with some twang. Things become jazzy and sassy on "End To The Lies". Here, Studebaker plays slide like no other by achieving a tone rarely attained. "Juke Joint Jump" is an accurately named harp hopping number. The Big Walter influence is obvious but John plays his harp at a furious rate. The guitar work on "Meant To Be" aspires to its Brewer Phillips, Hound Dog Taylor, JB Hutto and Otis Rush influences. Joe Zaklan plays catchy rhythm guitar allowing John to showcase his guitar antics. He may have quit drinking 25 years ago but his vocals are still whiskey-soaked and he lays them down on all tracks that have vocals. The uptempo organ of Pat Brennan lays the foundation for "Nothing Comes Easy" while the pounding drums of Earl Howell get it shaking. Here, John's velocity and amount of notes played on harp will have Sugar Blue turning sour and green with envy. Studebaker John is a strong singer/songwriter/guitarist/harpist/producer and like his song, "Rich Man", he is a 'rich man when it comes to good times'. Overall, this is a solid effort but in a genre that is saturated in barrelhouse blues-rock, there may not be appetite to absorb much more.